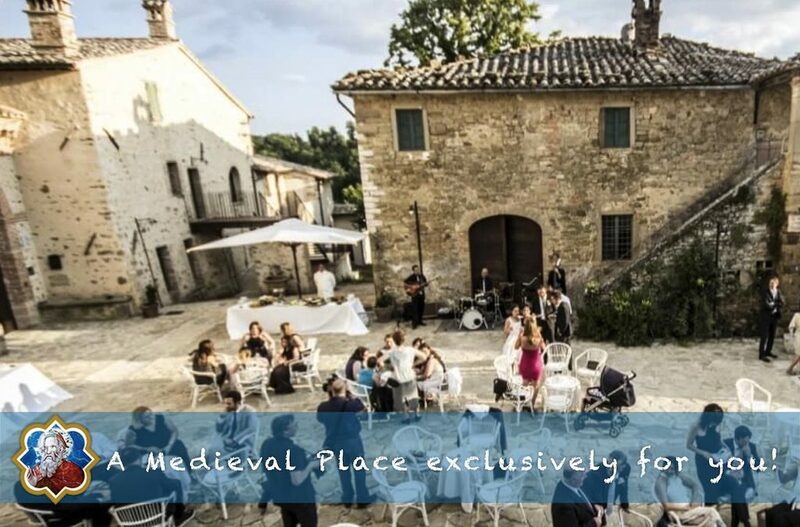 A Medieval Place exclusively for you! Do you want to make your vacation or your event really unique? For those looking for a unique and unrepeatable experience, Borgo Colognola is the ideal location. Elegant Historic House, where you can see the footprints left by history in different centuries, characterized by the living presence of ancient materials and architectural features, proudly kept intact with the restoration. The village is a small ancient city, to be experienced, combination of simplicity and charm of nature and of the Umbrian countryside, the luxury and elegance of the tabernacle of its apartments and reception rooms and the echo of the ancient agricultural traditions, kept alive by the owners, continuing to protecting the environment and landscape thanks to the Farm. Borgo Colognola meets the increasing requirement of people who want to enjoy authentic emotions and it gives the possibility of exclusively hiring the whole place and external areas. The apartments can accommodate a large number of people, they come with a fitted kitchen and they have breathtaking views of sunsets; the halls are suitable for parties, events, conferences and seminars; the outdoor spaces are divided by the ancient square sandstone, which also houses the old wood oven where we cook pizza and bread; the court which has an authentic medieval well; the garden and the areas of the ancient olive groves and vineyards. Last but not least, the swimming pool, the ideal setting for a relaxing day and entertaining evening to the sound of cocktails, barbecue and musical entertainment. If you’re going to get married soon or are looking to celebrate any type of event and you want to share this experience with only the people you care about, and eventually prolong the event for more than a day, stay at Borgo Colognola overnight, celebrate and combine everything to a vacation with your loved ones, which will certainly appreciate this option. The Village is even enhanced by a Baroque Church in which you can celebrate Religious Weddings but we can also organize Civil Ceremonies. Increasingly companies are looking for off-site locations for meetings, conventions and team building events: Borgo Colognola also responds to this type of requirements characterized by mild boundary between working and playful moments. The exclusive formula of the location is also perfect for art exhibitions, book presentations and artistic retreats in which groups of people who love art, they decide to pursue the inspiration in places that can summon it. The Historic Building, is nestled in the Natural Park of Mount Tezio and surrounded by countryside, this is therefore an excellent location for Yoga retreats and spiritual retreats, for those who want to retire, practice together and enjoy tranquility, who therefore need space for the activities and peaceful meeting places that only nature can offer. In this occasion, we are pleased to give the availability of a Vegan / Vegetarian Chef for the whole stay. Organizational capacity and the constant presence of the owners, ready to support you any time you need it, joins the wide range of services and activities that Borgo Colognola offers. Contact us to find out how to have Borgo Colognola exclusively for you, we are ready to customize every detail according to your needs.